Abstract: Laser ablation (LA) can facilitate direct analysis of solid samples for mass spectrometry (MS), and is often coupled with an inductively coupled plasma torch (ICP). LA-ICP-MS is now widely used for accurate elemental and isotopic analysis; however, the technique is not fieldable, primarily due to the gas and power requirements of the ICP torch. 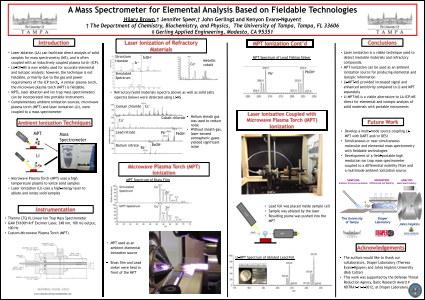 A mass spectrometer system for elemental and isotopic analysis using technology that is amenable to portable instrumentation is being studied. Solid samples are being ablated with an excimer laser and the resulting particle and ion plume will flow through a microwave plasma torch (MPT) and into an ion trap mass spectrometer. Preliminary data confirms that using laser ablation directly coupled with an ion trap mass spectrometer is a viable technique for detecting metals (e.g., lead, cobalt) and refractory compounds (e.g., strontium titanate). Current efforts are focused on enhancing sensitivity by incorporating a custom MPT, a modification of a design by Bilgic and co-workers which is being fabricated and tested. While we anticipate that LA-MPT-MS will have somewhat reduced sensitivity relative to LA-ICP-MS, MPTs, laser ablation and ion trap mass spectrometers can all be incorporated into portable instruments. This unique LA-MPT-MS instrumentation is promising for rapid elemental and isotopic analysis in the field.